1969 Mustang - Information, options,how to's, restoring your mustang and more! The 1969 Mustang was a continuation and improvement of the major changes started in the 1968 model year. Refining and modernizing the classic Ford Mustang styling, the boys and girls at Ford had some new surprises for the 69 model year. The 1969 Ford Mustang was a radical departure from the 1965 to 1968 Mustangs in many ways. Part of this change was due to increasing government pressures for improvements in vehicle safety for all automobile manufacturers, as well as tightening emission standards. most if not all American car manufacturer's typical 5 year production program. While the length of time before a major change has more to do with paying off tooling costs and maximizing profit than customer demand, this particular change in styling created quite a stir and brought the 1969 Mustang back in line with changes in it's competition, the Chevy Camaro and Dodge Challenger. The 390 cubic inch V8 was still available, with posted specs stating that it produced a conservative 320 horsepower and over 400 feet of torque. And I say conservative, because, Ford, responding to the "bad press" and subsequent jacking up of car rates for cars with engines bigger than 400 cubic inches and more than 350 horsepower, began to pick and choose the "rated output" for many of these high performance treats. Meanwhile, at the other end of the pony car performance spectrum, the standard inline six cylinder was still made available, but Ford added an additional 250 cubic inch six with horsepower upped to a somewhat less anemic 150. The previous year's 302 cubic inch v8 was still being made available as a 2 barrel model, however, new for the 1969 model year, were two different 351 cubic inch engines manufactured in Windsor Ontario, Canada. Both, two and four barrel carburetor options were made available and horsepower was increased from the base 302's 210 horsepower, up to 225 hp for the two barrel and 290 horsepower with the 351 cubic inch 4 barrel carbureted engines,respectively. 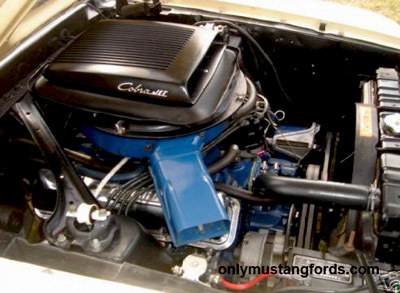 The 428 Cobrajet ( CJ )and 428 Super Cobrajet ( SCJ ) motors put out 320 hp and 335 hp, with the now much coveted Shaker hood scoop and Ram air ( a term coined by General Motors ), which directed the cooler outside air from outside the top of the hood in the airflow and passed it to the carburetor. To attain the Super CobraJet title, the 3.91:1 or higher ratio rear end had to be ordered. This cold air induction is still a popular way to get "free horsepower" from your motor, because when air is colder, it is denser and holds more oxygen. As well, since the air is entering the carb at a higher than normal velocity, the extra volume and oxygen, cause an increase in power. 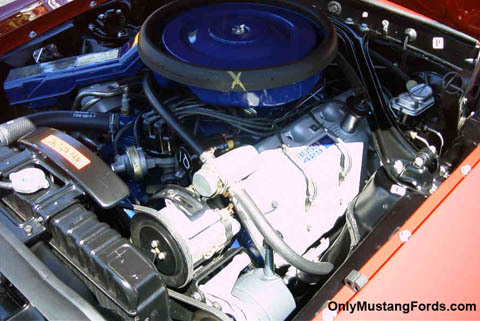 The 1969 Mustang's styling was fine tuned, and a unique 4 headlight system with 2 lights positioned inside the grille mouth, where in past models, had seen the addition of fog lights. The rarest of the breed was the homologation special, 1969 Mustang Boss 429, a purpose built 1969 Ford Mustang, which was designed to compete against the deadly 426 hemi powered NASCAR race cars developed by Chrysler. To qualify a motor for NASCAR, it had to be based on a street car motor, with a production of at least 1,000 motors. The only problem? It was too big to fit into the stock Mustang's engine bay. Ford Shipped out stripped down body/chassis to Kar Kraft, a custom car builder who had been involved in development of the original GT40 cars. Substantial changes to the body, frame and suspension were made to shoe horn the Huge 429 cubic inch engine into a too small engine compartment. Catch the full details in the Boss 429 Mustang section. 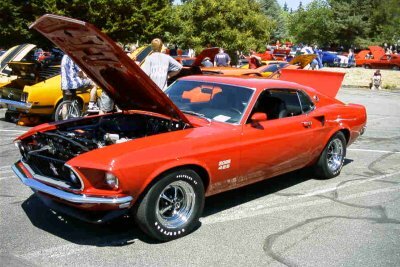 Due to the extensive changes to the entire vehicle, the Boss 429 Mustang is also one of the most difficult cars for enthusiasts to transform into a "clone" or tribute car.